SUBJECT: Meeting Regarding Group 1 Gap Pine Phaseout Held Ottawa 22 June 1961. At the request of 64AD, CCS-C arranged for a meeting of 64AD personnel and appropriate Canadian government representatives in order to determine proper procedures and channels for the return of Group 1 radar sites to the Government of Canada. Personnel attending the meeting are as indicated in Attachment #1. The meeting was chaired by Mr Loughead of DND. Problem: Which sites are to be returned to the Governmnet of Canada in toto. Solution: The 6 gap filler sites are to be returned to the Government of Canada with no reservations. It was also agreed by Mr Loughead during this discussion that any equipment the USAF desires to leave (abandon) would be accepted by the RCAF. It is the RCAF feeling that they will retain any of the equipment that they can use and offer the remainder to other Canadian government agencies and if there are no takers for this equipment, they will declare it to CADC. 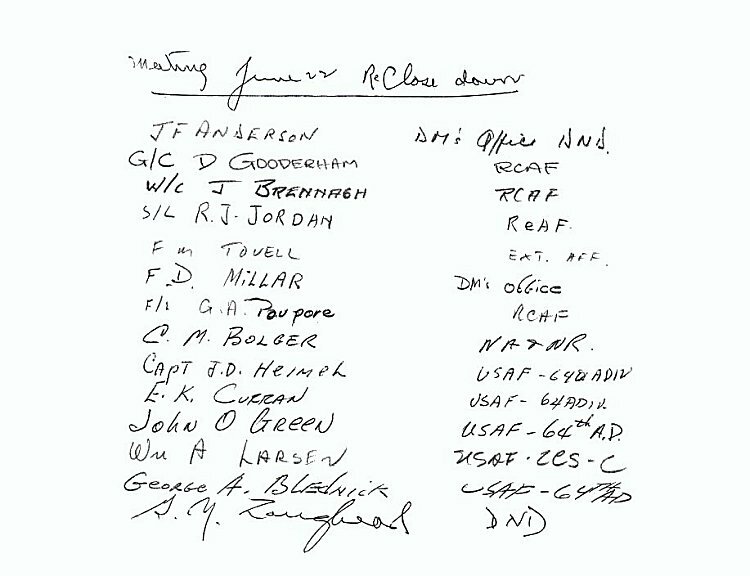 RCAF also indicated that it will be their responsibility to provide security for the sites after they have been released by the USAF (on or before 1 October 1961). Problem: What unit or units did the USAF intend to keep at Baffin Island, Resolution Island and Redcliff. Solution: (1) Baffin Island. SAC has indicated an interest in this site for possible housing of DOT contract caretaker personnel at Frobisher. It was agreed that SAC's desires would be obtained as soon as possible in order that RCAF could properly canvass Canadian Government agencies as to their desires for this property. This will be accomplished by CCS-C at a meeting to be held with 2AF personnel on 26-27 June. (2) Resolution Island: There will be no turnback of properties at Resolution Island but instead it will be transferred to AACS for the accomplishment of their communications mission. (3) Redcliff. The 99 year lease portion of Redcliff will be transferred to the US Navy. Remainder of the area will be returned to the Canadian Government. RCAF has indicated a possible interest in this area as a location for a receiver transmitter site. On the spot permission was given to G/C Gooderham to send an officer to Redcliff to survey. Mr Loughead requested that 64AD deal directly with the RCAF regarding the release of these properties. All that RCAF desires upon release of the properties is a general description of the land and a detailed listing of all remaining equipment. 64AD stated that they would be able to give RCAF a preliminary list of equipment to be left behind within 1 to 2 weeks. Mr Loughead also requested that he and CCS-C be kept informed as to the SAC requirements at Baffin Island. Contact point for 64AD in RCAF is Wing Commander Brennagh, CCE/Prop, 6-6771; DND contact will be Mr Loughead; 64AD contact is Major Blednick; CCS-C contact Lt Col Larsen.